The earrings you choose to wear on your wedding day will depend on a whole host of factors, from your hair-do to the style of your dress. Here are our top tips on how to pick the right pair for your ensemble. On your wedding day, it’s just as important to select the right earrings and hairstyle, as it is to choose the perfect dress. These two elements are going to have a major effect on your overall look. With the hair-do and earrings you choose, you can really direct where people’s eyes will be drawn, so your earring choice should be informed by your face shape – simple studs probably wouldn’t be your top choice if you have a round face or short hair style, for example. Read on for some tips on how to get it your ear accessories just right. If you’re going for a modern look with your wedding day ensemble, then an edgy pair of geometric earrings is the perfect choice to draw attention to your face. The gorgeous triangle earrings from Thomas Sabo feature tiny triangles and gleaming diamond embellishments, and are the ideal choice if you want something truly striking. 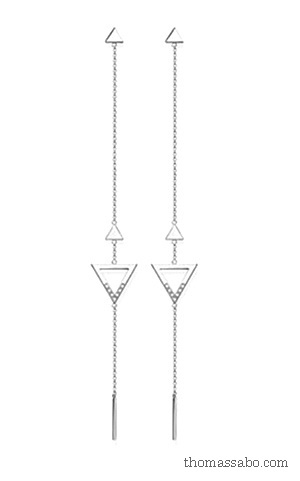 Thanks to their long, slim shape, these earrings fall into the ‘shoulder-duster’ bracket. Swirling elegantly around the neck of the person wearing them, they’re great for drawing attention towards your face. If you’re going for a vintage hairstyle with loose waves pulled back into some kind of side chignon, then you’re going to need a pair of heirloom-inspired earrings to totally pull the look off. The sterling silver Elegant Beauty Drop earrings from Pandora feature two radiant freshwater cultured pearls and are also embellished with tiny mixed stones for an extra sparkle. 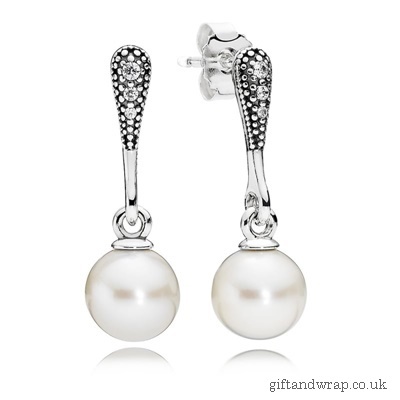 The pearls mean this pair of earrings is perfect if you want to pull off your vintage look without a hitch. Another advantage is the fact that thanks to the vintage style, they’ll never go out of fashion, so you can wear them for years to come after the big day. If you opt for a strong up-do, like a topknot, or if you have a pixie crop haircut, you’re going to want elegant drop earrings that really frame your facial features. As well as elongating your face, drop earrings will also draw people’s eyes upwards to look at your face. 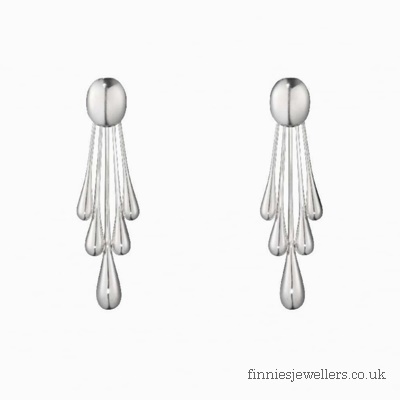 Dangling earrings are incredibly versatile, and the sterling silver Archive Collection earrings from Geog Jensen are a classic example. Eye-catching and iconic, the design features several silver threads that each evolves into unique drops. Wear something like this, and you’re bound to make an impact. Dangling earrings are also an excellent choice to complement sleek low bun hairstyles, but you might not want statement chandelier earrings in case you find there’s too much going on around the top of the neck area. A simpler pair of drop earrings should do the trick. 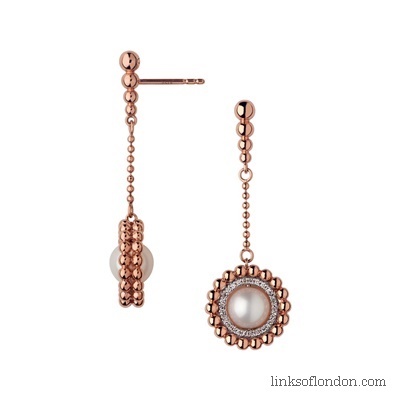 Crafted from 18 karat rose gold, the effervescence drop earrings from Links of London tick all the boxes when it comes to sophisticated style. Diamonds and freshwater pearls work in harmony with the rose gold, falling elegantly from a diamond cut chain. The perfect option if you’re looking for something classic. If you’re planning a bohemian ensemble, then it’s likely that you’ll be considering some kind of side braid for your wedding day hairstyle. Because the braid will probably be draped over the front of one of your shoulders, you don’t want to risk selecting dangling earrings and having too much going on. Instead, a simple pair of hoops should do the trick. 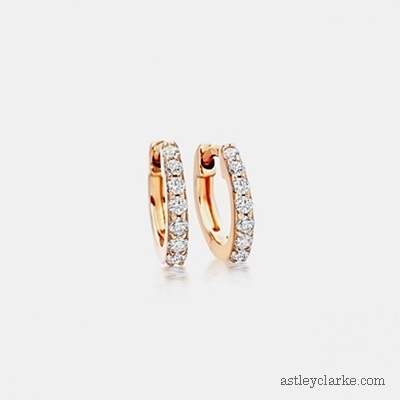 The rose-gold hoops from Astley Clarke are simply stunning. Luxurious yet understated, the Halo 14-karat hoop earrings gently hug the ear, which will be embellished by a chain of elegantly-set pave diamonds.